Ok I know everybody has to act sickeningly concerned about this whole situation, but lets break it down. Every analyst has an issue with how this guy was a Notre Dame football player and could easily have had a real girlfriend, but is anyone going to mention the eyebrows, or the teeth!? Yes, reputation is great, but at a certain point you’ve got to spend time with the guy. Hey as far as I’m concerned he had a girlfriend, and she was HOT. I just think its going to be funny when he tells people about his future girlfriends, there will always be that air of doubt surrounding his relationships. 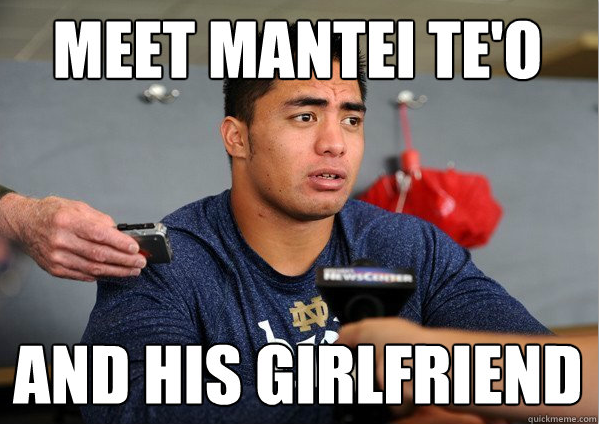 Te’o’s Father: Hey Mantei I’d love to meet your girlfriend if she isn’t dead or something.